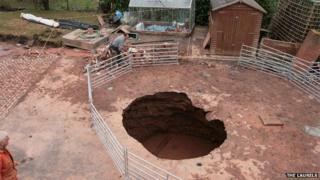 A sink hole has opened up next to a bed and breakfast in north Staffordshire. Phil Tester, owner of The Laurels, in Oakamoor, said the chasm appeared on Thursday morning and now stood at more than three metres (10 ft) wide and is expanding "all the time". Mr Tester said experts were on site to try and find out what caused the hole to appear. The hole followed drilling work at the property this week to check damage caused by a nearby landslide last year. Mr Tester said: "It's been an incredibly stressful time, there have been a few tears. "It's not just our business, it's our home and [wife] Helen's parents' home. "We were all in guest bedrooms last night, in rooms furthest from the hole. But, as you can imagine, we didn't sleep very well." He said it was difficult to determine the depth of the hole as "deep water" had been found almost two metres down. The business was forced to close two weeks ago after cracks in the property were followed by damage to the car park, fence posts and walls. The B&B is built on a hill and work to excavate land further down for redevelopment was stopped by the Health and Safety Executive in January after the landslip. Mr Tester's insurers brought in engineers last month to assess damage and monitor the landslide. He said his property was built over a clay pit and experts had struggled to find solid rock. "It's only our second season here and we've had to unpick our whole business," Mr Tester said. "We've had to pay back deposits. One woman booked in September for April, a special birthday booking. "We've had to cancel it with just a fortnight's notice." The hole is now due to be filled in with rocks, before being injected with concrete. A concrete cap will then laid on top. Video What causes sinkholes and why has Britain seen a spike?